Review: Sharkoon X-Tatic Digital v3: the ultimate games console accessory? Sharkoon X-Tatic Digital v3: the ultimate games console accessory? With the Xbox 360 and PlayStation 3 games consoles continuing to sell like hotcakes, millions of gamers now enjoy full-HD visuals full of eye-popping content - but are they making the most of what's on offer in terms of audio? If you're still gaming with stereo sound - or, worse still, you're being forced to turn down the volume whilst the better half reads the latest in the Twilight series - what you need is a 5.1 gaming headset. Such devices have been doing the rounds for years, with the hardened PC gamer rarely accepting anything less. For the console user, however, there's a smaller selection to choose from, and few headsets that are compatible with systems from both Microsoft and Sony. 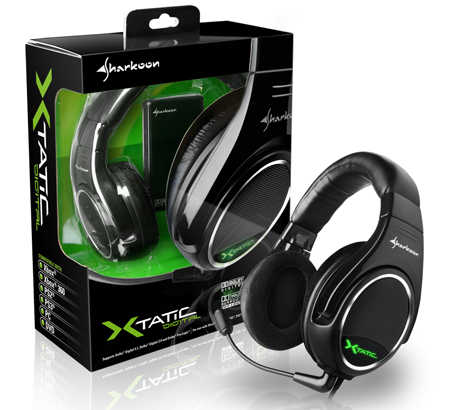 One that touts compatibility with both the Xbox 360 and PlayStation 3, however, is the Sharkoon X-Tatic Digital v3. This third-generation, 5.1 headset promises high-quality sound that should propel gamers into an immersive Dolby Digital environment. We're here to take a look, and ladies (or possibly gents), if your significant other has recently disappeared into obscurity with the arrival of major titles such as Call of Duty: Modern Warfare 2 and Forza Motorsport 3, read on to find out why the Sharkoon X-Tatic Digital v3 might just be the perfect Christmas present.